Christophe Mao made his reputation presenting classical Chinese furniture in materials and forms not normally found in the marketplace. Following the premise that what is ancient is modern and what is modern is ancient, he has juxtaposed traditional furniture with modern and contemporary art. The 30 pieces of furniture in this exhibition will mainly cover the 17th and 8th centuries and one particularly fine jumu piece is an elegantly simple three-shelf, 17th-century bookshelf. Of course there will be a group of shcolar’s articles. What I found intriguing about the exhibition are the paintings of Yun Gee (1906-1963), one of a small but influential group of Chinese artists living and working in the West, particularly in New York, in the years before World War II. Born in Guangdong in 1906, he immigrated to San Francisco at the age of 16 to join his father. San Francisco at that time was the most vital centre of American Modernism outside of New York and he enrolled at the California School of Fine Arts. He was befriended by one of the faculty, Otis Oldfield, who had lived in Paris. Oldfield absorbed contemporary theories of painting to develop his own theory called ‘Colour Zones,’ which meged Orphism and Synchronism. Gee’s painting from this period, Man in a Red Chair, shows Oldfield’s influence with broad bands of colours and strking tonal conflicts. He moved to Paris from 1927 to 1930, exhibited there and married a French poetess, from whom he was later divorced. During his time in Paris, he visited New York, but returned permanently in 1932. One of his earliest New York works is the bronze, Walking Couple. He exhibited at the Museum of Modern Art’s 1932 Murals by American Painters and Photographers exhibition. His second wife, Helen, was famed for her early support of American women photographers and is considered responsible for elevating them to icon status. She is still alive and frequently lectures here in New York. Even though he exhibited little in his later years, Gee is being rediscovered as an important contributor to 20th-century American art. There was a recent, single artist auction of his paintings at Sotheby’s, and this exhibition will be the first one in New York since 1983. 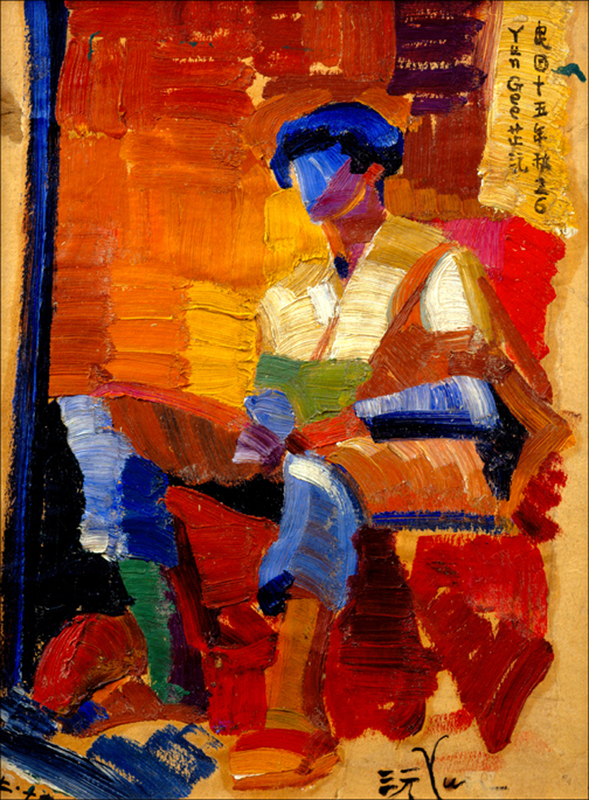 Robert E. Harrist, Jr., Professor of Chinese Art at Columbia University, described him as ‘a restless, inventive painter, sculptor, poet and performer, who held one-man shows in San Francisco, exhibited in Paris galleries, and gave classes in New Cubism’ in his Greenwich Village apartment – all before reaching the age of 30.